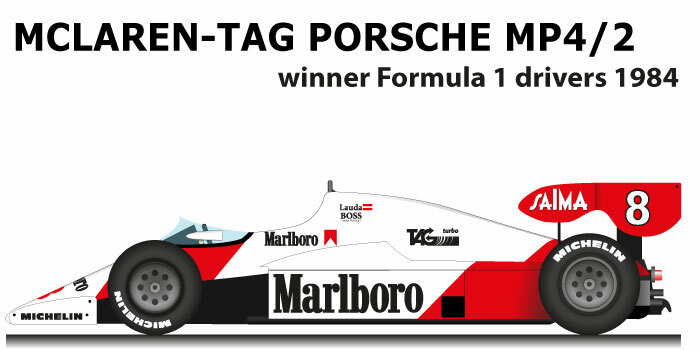 The McLaren – TAG Porsche MP4/2 n.8, and the winning car of the 1984 Formula 1 World Championship. For the Woking team 1984 was the year that made it the most successful team of the 80s. The MP4/2 was designed by John Barnard, the British engineer created a chassis that together with the Porsche engine and the TAG electronics proved very competitive. Niki Lauda with McLaren – TAG Porsche MP4/2 n.8 won the Formula 1 World Championship in 1984, for the Austrian rider was the third and last world title in his career. The season was a duel between the two McLaren team riders, Lauda and the French Alain Prost. won five Grand Prix: South Africa, France, Great Britain, Austria and Italy. The World Cup was decided at the last race and despite the seventh victory of the French rider to the Austrian only the second place was enough to win the World Championship for only half a point. McLaren also won the Constructors World Championship.